I just watched the series finale of Star Trek: Enterprise. Meanwhile, the Trek universe doesn't look any brighter. There's no new series in the offing and no new movie in the can. Thus, for the first time since the late-70s, there will be no new Trek episodes on air. For me, I was drawn into the world of Star Trek when Patrick Stewart voiced over these words, "Space. The final frontier. These are the voyages of the starship Enterprise. Its continuing mission: to explore strange new worlds, to seek out new life and new civilizations, to boldly go where no one has gone before." It was probably in the early 90s when TV3 (new station at that time) brought the Next Generation into Malaysia. Thus for an hour, I was drawn into an utopian universe full of adventure, possibility and promises of a better, kinder tomorrow. The latest franchise, Star Trek: Enterprise has its ups and downs. When it premiered, IMHO it was the best first season since The Original Series, it held unlimited promise. Then everything fell apart in season 2. It was like a torture watching the series. However, a season long arc helped the third season improve, and when season four arrived, with a new showrunner, it was terrific! Finally, comes the series finale, ‘These Are The Voyages…’ For me, it's a dissapointing end to the series... it's told in a third-person prespective, like a re-creation of history. Seriously, the story was good, but the way the writers tell the story is utter !$%^&* rubbish. Oh well, after all the trouble building up a great fourth season, everything fell apart in the finale. Sad, but after watching the finale... I'm glad it's finally over. I was usually working when the original "Star Trek" was on TV, but, when it went into syndication, I became a big fan. The original series obviously felt its way along until it found its space-legs. For example, in the original pilot (which became part of "The Menagerie"), we have a grinning Spock, but by the time of Captain Kirk, Spock settled into the cool-headed, usually unemotional Vulcan who eventually could put down an opponent with a neck-pinch. The classic had some silly-to-awful episodes, ranging from a shootout at the OK Corral to a theft of Spock's brain. It also had episodes of comedy. The last episode, "Turnabout Intruder," made when Shatner was ill with the flu, holds up nicely; it wasn't great dramedy, but was a worthy take on Thorne Smith's gender-switching novel, "Turnabout." When the films began, "Star Trek: The Movie" was one-third story, one-third special effects, and one-third light show. Roddenberry was excusing some script problems because he had one cast lined up and then Shatner, Nimoy, and others agreed to sign up. That wasn't a sufficient excuse for what wound up on the screen. Films #2, 3, and 4 were better. Meanwhile, the TV spinoffs began. "Next Generation" opened in an appalling manner. It was extremely involved and seemed to try to lay out the SNG universe all at once. Patrick Stewart, of course, anchored a fine cast, and the show eventually settled down, although it was hampered by one thing: Roddenberry had decided that in only a couple of centuries, the people in the future from ST Classic time had learned how to "get along." Unfortunately for effective drama, fiction, film, and TV, stories work best when there's conflict. "Deepspace 9" next opened up and became my favorite of the spinoffs. It had a darker tone, which probably turned off some viewers. Its cast also had some excellent acting chops. "DS9" also used CGI to rework "The Trouble with Tribbles," as the "DS9" actors were woven into the Shatner-Nimoy episode. "DS9" finished its story of the space station, pressured by the competition of "Voyager." This next series began by combining what today we would call freedom fighters and the feds. They had to use one ship when the second was destroyed. So they combined forces, and everyone generally got along just hunky-dory, no strife or bickering as we would expect from such a merger. Then the series was doing retreads of the "classic" series. Q appeared and, of course, provided great fun. Janeway and Tom Parrish camped it up in a satire on Flash Gordon/Buck Rogers serials of the 1930s. Now, we come to "Enterprise." 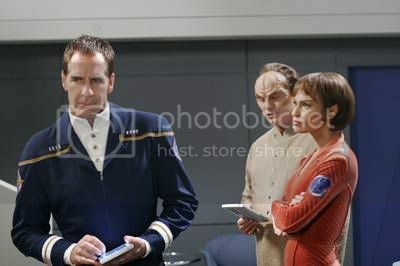 On the plus side, we had Scott Bakula, whose acting range exceeds that of Shatner and Brooks. We saw his strengths in the "Quantum Leap" series. "Enterprise," however, did not call upon a fourth of his skills. On the other hand, Captain Archer (not to mention Sisco and Picard) was more realistic as a captain than Kirk was. When the series came to a close, with that holodeck-history device, it was definitely time to pull the plug -- not because of the failure of the cast, but of Paramount execs and writing crew. "Enterprise" was a much more interesting than one proposal that the execs were favoring at one time: "Hey, get this," they must have said. "We go back to the Academy, and the cadets there are a young James T. Kirk, and Spock, and Dr. McCoy." Now shudder like Lurch as you exclaim, "Dear God in heaven." Probably each of us imagines that he or she would like to be a writer on a favorite TV show. Of course, we don't follow through because it might get cancelled right off the bat or after four years. So we stay at more reliable jobs. An ideal series would be "Star Trek: Tales of the Federation" (or "The Federation Logs"). One episode could feature, say, a story about Captain Sulu; another about Admiral Janeway and perhaps Captain Cisco on a dangerous mission. The Paramount crew could create new characters and draw upon the many, many actors who want to become part of the Star Trek universe. Life will go on without a "Star Trek" series. I'm sure it will. Oh well. Star Trek: Enterprise - These are The Voyages Farewell to "Enterprise"